Spearheaded by Tom Kayser and a hardworking group of volunteers from the Notre Dame High School community, progress is being made on improvements to Spartan Stadium. With funding from a $25,000 grant received through a State Farm competition last year and volunteer efforts, enthusiastic supporters are proceeding with necessary repairs and maintenance of the historic structure. The Scioto Foundation, where an account has been set up to handle the grant funds on a pass-through basis, is serving as fiscal agent for the project. “We are really thrilled that we can help maintain the proud history of Portsmouth,” said Scioto Foundation Executive Director Kim Cutlip. Spartan Stadium, which was built in 1930, played an important role in early National Football League history as one of the earliest professional football stadiums in the United States. After the Portsmouth Spartans became the Detroit Lions, the stadium was abandoned, but is still used today for high school sports like Notre Dame High School football games and community events. It is also currently the home field for the Portsmouth Warriors semi-pro football league. Dr. Sean Dunne, sociology professor at Shawnee State University wrote and submitted a grant to State Farm Insurance’s Neighborhood Assistance program seeking funds for improvements and the preservation of the stadium and Portsmouth residents voted the project into second place in the competition to win the $25,000 award. Kayser reports that, to date, grant funds have paid for repair and replacement of the sprinkler system, installation of a security system and repair of all interior doors and locks, as well as doors and locks on the press box and exterior gates. Ben Davis also has made arrangements for to have the press box roof replaced for no charge. With the remaining funds, the group plans to make repairs and upgrades to the electrical system, according to Kayser. Notre Dame volunteers have paid a lawn care service to treat and cut grass inside the stadium, had two restrooms and three locker rooms repainted and purchased a new console for the score board. In addition, Truman Hash repainted the score board for his Eagle Scout project which was sponsored by the Schmidt family, paying for the materials as well as the marquee above the scoreboard. 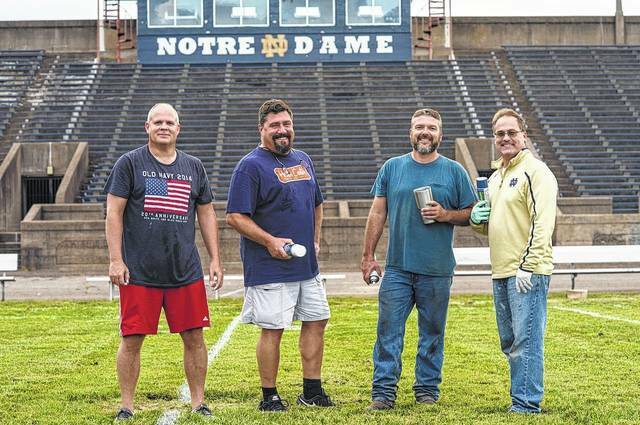 The Notre Dame High School volunteer group, with the assistance of the Portsmouth Department of Public Services, has worked to maintain Spartan Stadium for over a decade. Now they are campaigning to restore the historic sports facility. Kayser’s list of projects that need repair or restoration include the concrete structure on the home side, home and visitor bleachers, the transformer and breaker box for the east side field lights, the press box, plumbing and electricity, track and field areas, the exterior stadium walls and the visitor side ticket booth. Dr. Dunne is actively pursuing more grants to fund some of the higher costs such as the track replacement.